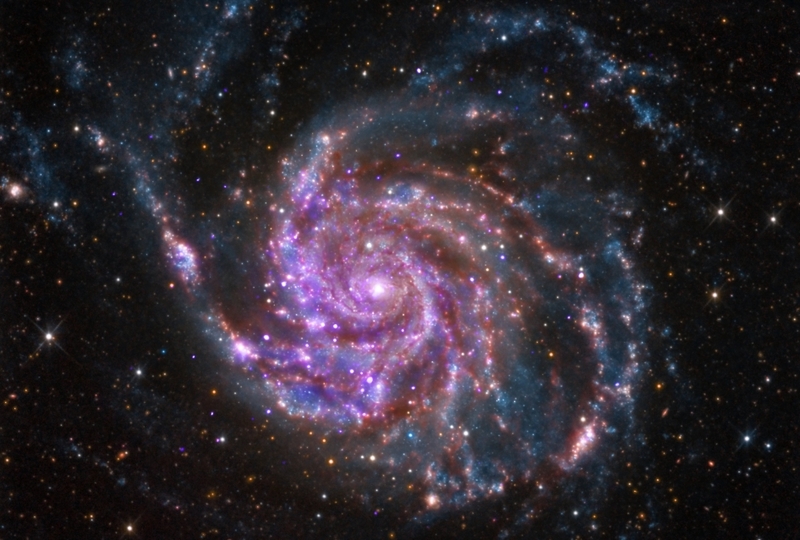 M101 is a spiral galaxy like our Milky Way, but about 70 percent bigger. It is located about 21 million light years from Earth. X-rays from Chandra reveal the hottest and most energetic areas due to exploded stars, superheated gas, and material falling toward black holes. Infrared data from Spitzer shows dusty lanes in the galaxy where stars are forming, while optical data traces the light from stars. This image is part of a “quartet of galaxies” collaboration of professional and amateur astronomers that combines optical data from amateur telescopes with data from the archives of NASA missions. NASA’s Marshall Space Flight Center in Huntsville, Ala., manages the Chandra program for NASA’s Science Mission Directorate in Washington. The Smithsonian Astrophysical Observatory in Cambridge, Mass., controls Chandra’s science and flight operations. This entry was posted in ASTRONOMY, ASTROPHYSICS and tagged M101. Bookmark the permalink.